What happens at a 'knees-up'? Feifei been training for one but Rob's about to explain that she can relax and enjoy herself, she won't be needing her knees! Find out more in this programme. Hello, I'm Feifei and this is The English We Speak. … and hello, it's Rob here. Err, Feifei, I hope you don't mind me saying but you look a bit hot and sweaty. That's because I've been training for this 'thing' that Dan's having for his birthday. A 'thing' – what sort of thing? Well according to his party invitation, he's having a knees-up to celebrate his birthday. I'm not sure what it is but I wanted to be prepared by getting fit. Look I can get my knee up to my chin! That's impressive but completely unnecessary. 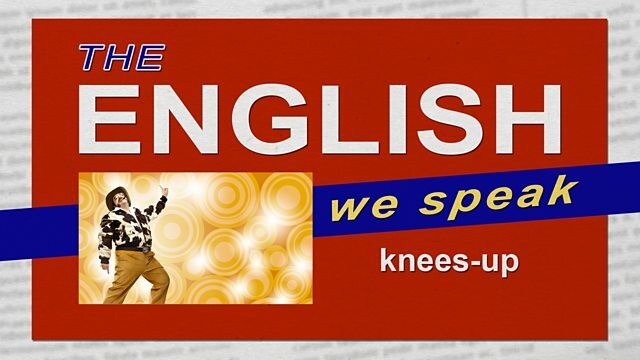 A knees-up is an informal way of saying a lively party where there's usually dancing. So he's having a party! Oh right. So I've been invited to Dan's birthday party! Well, if there's dancing I still need to get fit. Sorry I'm a bit sleepy today, we had a big knees-up last night. It was great! We're planning a knees-up for Dad's 70th birthday, I hope you can come. Now our exams have finished, let's have a knees-up at my house tonight! So a knees-up is a lively party or gathering to celebrate something. This is going to be fun! And lots of celebrating. But this knees-up will be missing one thing. Me. I won't be coming – I haven't got time – I'm up to my knees in paperwork. 'Up to your knees' in paperwork! You mean you've got too much work to do – come on Rob, be honest, you haven't been invited! Well….yes. I can't dance anyway, I've got a bad knee. Excuses. I'll let you know how it goes. Bye!